Our Classic 12 mixed rose bouquet. Imagine the delight when your recipient receives this bouquet with a splash of colour from our entire range. 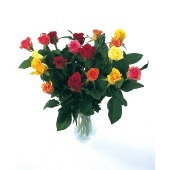 This is a wonderful gift of superb roses from deep red, blush pink to golden yellow.